The all-new 2016 Honda HR-V crossover, unveiled today at the 2014 Los Angeles International Auto Show, blends the styling of a coupe, the toughness, space and utility of a SUV and the quality of a Honda in one sporty, personal and versatile multi-dimensional vehicle. The well-equipped HR-V, launching at Honda dealerships nationwide early next year, will enter the fast-growing entry crossover market with dynamic yet refined exterior styling, fun-to-drive performance, class-leading fuel economy ratings and unmatched interior spaciousness and cabin versatility. 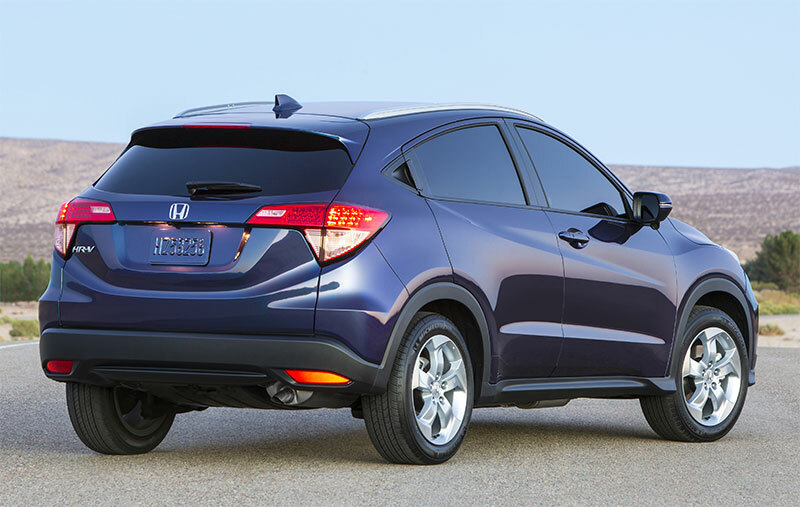 Utilizing a new global platform, the all-new Honda HR-V has one of the most spacious and versatile cabins in its class. Utilizing its unique platform design with a center-mounted fuel tank and reconfigurable second-row “Magic Seat,” the completely new HR-V has voluminous interior space along with a flexible cabin featuring multiple seating/cargo modes. With 100.1 cu. ft. of passenger volume (LX) and 58.8 cu. ft. of cargo volume with the second row seats down, the HR-V has space to rival some competitors’ mid-size SUV offerings. The HR-V’s dynamic appearance and sporty, solid stance is aided by its coupe-like cabin shape and bold and powerful face, complemented by distinctive side contours, including a sharply upswept character line, deeply sculpted lower body form and the strong horizontal taper of both the front and rear fascia. Concealed rear door handles further enhance its coupe-like appearance. The HR-V’s sporty and sophisticated interior features an expansive, airy cockpit with an abundance of soft-touch materials and premium detailing punctuated by precise bezels, sophisticated stitch lines and upmarket brushed chrome and piano black highlights – all fitting its mission as a youthful yet refined personal crossover vehicle. The three-meter driver’s instrument cluster features “floating” illumination rings and Honda’s ECO Assist feature, wherein the speedometer illumination changes from white to green depending on the fuel efficiency of the driver’s vehicle operation. Power comes from a highly refined and responsive 1.8-liter SOHC 16-valve 4-cylinder engine with i-VTEC valvetrain producing a peak 138 horsepower at 6,500 rpm and 127 lb.-ft. of torque at 4,300 rpm (both SAE net). The engine is mated to a sporty and fuel-efficient continuously variable transmission (CVT) with Honda “G-design” shift logic, or a slick-shifting 6-speed manual transmission (2WD models only). The HR-V is available in either two-wheel-drive or all-wheel-drive drivetrain configurations. All-wheel-drive models feature Honda’s Real Time AWD with Intelligent Control System for outstanding all-weather traction and control. Driving efficiency, handling performance and cabin quietness are further aided by an aerodynamic shape and a lightweight yet rigid body structure with significant noise-insulating materials and design features. In keeping with Honda’s commitment to safety, the HR-V is expected to deliver top-in-class collision safety performance and incorporates Honda’s next-generation Advanced Compatibility Engineering™ (ACE™) front body structure, designed to more efficiently absorb and disperse the energy from a frontal collision. Standard safety and driver-assistive features include four-channel anti-lock brakes (ABS) with Brake Assist and Hill Start Assist; Vehicle Stability Assist™ (VSA®) with Traction Control; an Expanded View Driver’s Mirror; a Multi-Angle Rearview Camera; dual-stage, multiple-threshold front airbags, driver and front passenger SmartVent™ side airbags and side-curtain airbags for all outboard seating positions; and Tire Pressure Monitoring System (TPMS). The HR-V is anticipated to earn top collision safety ratings from the NHTSA (5-Star Overall Vehicle Score) and IIHS (Top Safety Pick). Standard equipment on all HR-V models, available in LX, EX and EX-L trims, include power windows, power mirrors and power door and tailgate locks, electronic parking brake, rearview camera, aluminum-alloy wheels, tilt and telescoping steering wheel with audio and cruise controls, Bluetooth® HandsFreeLink® phone interface and Pandora radio. Higher trim models can be equipped with premium features including Honda’s 7-inch touchscreen Display Audio telematics interface, Honda LaneWatch™, Smart Entry/Push-Button Start, paddle shifters, SiriusXM® radio, HD Radio™ and Honda Digital Traffic, heated front seats, a power sunroof, embedded navigation and leather trim. The 2016 Honda HR-V is covered by a comprehensive 3-year/36,000 mile new vehicle limited warranty and a 5-year/60,000 mile powertrain limited warranty. Additional benefits of ownership include Honda Roadside Assistance, which provides free 24-hour roadside assistance during the 3-year/36,000-mile new vehicle limited warranty term. The HR-V will be manufactured alongside the Fit at Honda’s newest North American auto plant, in Celaya, Mexico. Content, video and images provided by: American Honda Motor Co., Inc.